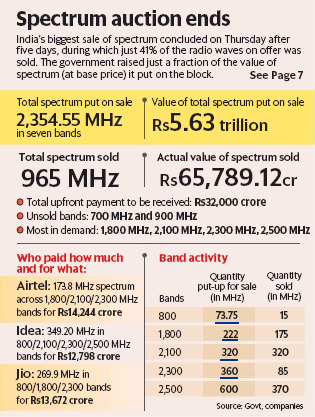 The government's ambitious spectrum auctions fell short of expectations, fetching the exchequer Rs.65,789 crore as it could sell only around 40% of the record 2,353MHz airwaves that had been put up for sale. 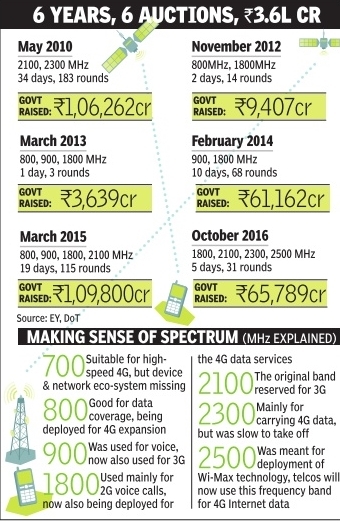 The government would have garnered Rs 5.6 lakh crore if all the spectrum on offer was sold at the reserve price. 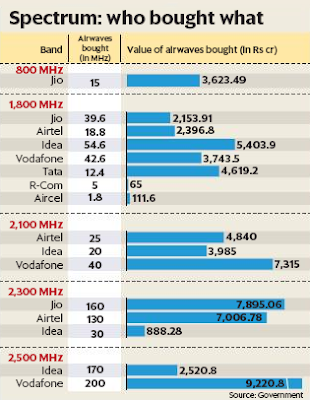 While the cash-strapped telecom operators made bids for spectrum in the 1,800MHz, 2,300MHz and 2,500MHz bands -used for providing high-speed 4G internet services -there were no takers for the 700MHz band, which was put up for sale for the first time but was rejected by the operators for its seemingly “high pricing“. Sources said the government, and regulator Trai, will now “have a re-look“ at pricing of the 700 MHz band and what led to a zero response in the sale. Vodafone, which does not have pan-India 4G presence, spent the maximum, shelling out over Rs.20,000 crore for buying the coveted airwaves. On the other hand, Bharti Airtel spent Rs.14,244 crore while Reliance Jio -which has unleashed fierce competition in the segment -will be paying Rs.13,672 crore. The Birlas-owned Idea Cellular, which is also desperate to expand 4G footprint, spent Rs.12,798 crore. The government has been assured of Rs.32,000 crore as upfront payment from the sale, which is the “highest in the last five years“. 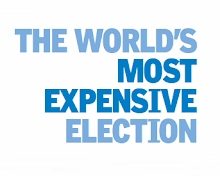 The rest of the payment will be over a 10-year period after a two-year moratorium. 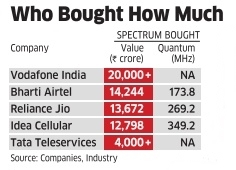 With the auctions now ending after 31 rounds and 5 days, the all-time record for the highest collection from spectrum sale remains at Rs.1.1 lakh crore, which was achieved last year. 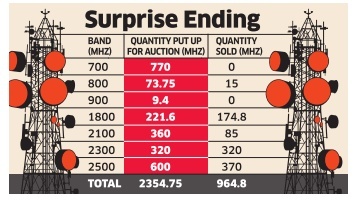 There were no takers also in 900MHz band, though this could be due to the very low quantity of spectrum (9.40MHz) that the government had put up for sale. 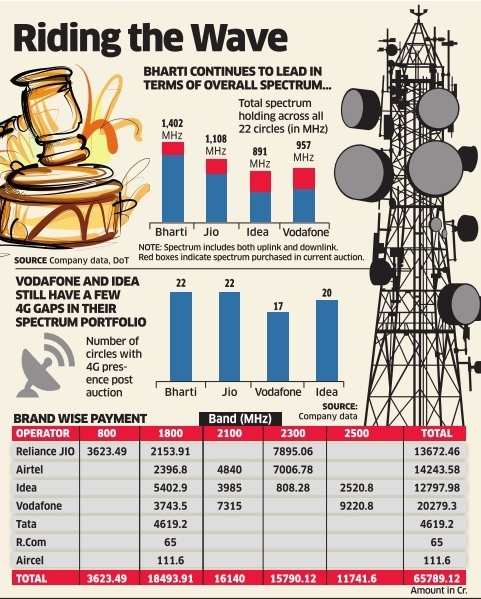 The telcos also bought spectrum in the 2,500MHz band, which they also intend to use for carrying high-speed 4G data. 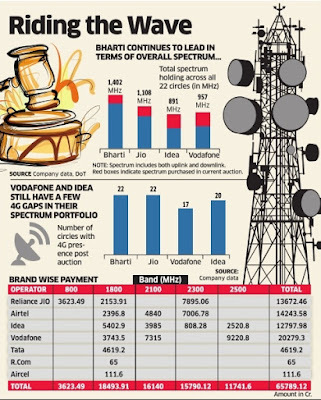 The companies can use the spectrum over a period of 20 years and analysts say that complaints of spectrum shortage should be addressed after the end of this round of auctions.